It’s a big world out there. The U.S. makes up a little less than half of the global market cap. By avoiding international stock markets, you cut out half of the investment opportunities. Why limit yourself? The chart below breaks down the annual performance of developed international stock markets. Each country’s performance seems to bounce around at random year after year, but over the long term those returns smooth out. 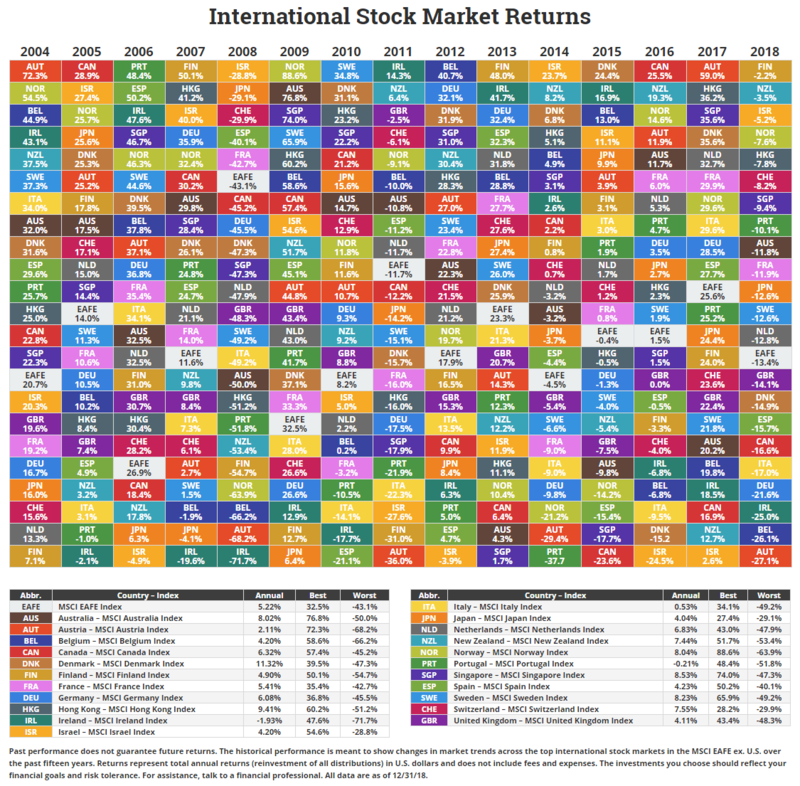 While it’s difficult to pick the best performing country every year, a diversified global portfolio offers the benefits of international stock market performance which in turn lowers risk. The table below ranks the best to worst international stock market performance over the past 15 years. Hover over the table to highlight each country’s market returns over that period. Past performance does not guarantee future returns. The historical performance is meant to show changes in market trends across the top international stock markets in the MSCI EAFE ex. U.S. over the past fifteen years. Returns represent total annual returns (reinvestment of all distributions) in U.S. dollars and does not include fees and expenses. The investments you choose should reflect your financial goals and risk tolerance. For assistance, talk to a financial professional. All data are as of 12/31/18. Or you can also download an image of the international returns table.